Welcome to the Hillyheights wine-making site. 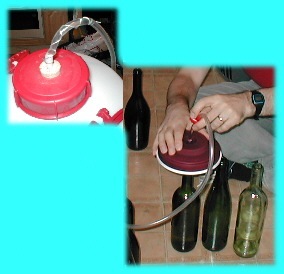 This site will give you a step-by-step guide on how to make wine from home-grown grapes. It is written with the UK in mind and is all from the experience of growing grapes for wine in our infamously unpredictable, sometimes dismal climate, but the methods may clearly be useful for those from warmer, sunnier climes. 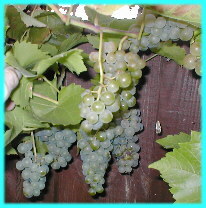 There are various varieties of grapes that grow well in the UK, but I find Seyval Blanc particularly good, and there are also some red varieties that grow well too. If you use red grape you will still get white wine unless you add a step to get the colour out of the skins. Hopefully, you're reading this site because you already have a vine that provides you with pounds of lovely grapes that you were wondering what to do with. If you haven't got a vine yet, we sometimes have some young vines, so feel free to register an interest at vines(a)hillyheights,co,uk. In the UK grapes are likely to be ready the first or second week in October just as the leaves show the first hint of turning. Don't be tempted to pick them too soon; it's better that some get a little over-ripe. Once you've picked all the bunches, remove the grapes whilst sorting through and removing any mouldy ones which could taint the wine. Next comes the hard task of getting all that grape juice out. It won't work to just try and squash them in a press; they simply won't burst because a sphere is the strongest shape of all. There's nothing for it but to put your hands in a break all the grapes. After that you can use a press, a fine net bag, or just a large sieve to get the juice. Collect the juice in demijohns which hold about one gallon each and make five to six bottles. It is possible to make wine of various strengths, but about 11% is probably about best as it will keep well and taste good. Take a look at this TABLE, on the left is the density figure from the hydrometer reading. The next column is the sugar content, but it's the following two columns that you need. They tell you how much sugar to add per unit volume of wine. The only reason for the two columns is that some people like pints and ounces and others are metric. The first column tells you how many ounces of sugar to add per pint of wine (please note that these are UK pints which are 1.25 of a US pint), and the second column is grams of sugar per litre of wine; use which ever column you prefer. 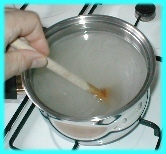 To add the sugar put it in a saucepan and add enough water to cover it by about 1" (25mm). Heat the mixture to make a thick syrup. You can stop heating as soon as all the sugar grains are gone. The syrup can then be added immediately to the grape juice. 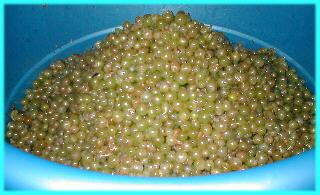 This step is optional but a good idea for UK grapes as they can be a bit too acidic. All wine is acidic and it's vital for the taste, but many people don't like their wine too acidic. The solution is calcium carbonate, or chalk. The chalk to use is called precipitated chalk, which is bought from wine-making shops; this may be harder to obtain than some of the other ingredients. The amount to add is about 16g per gallon, 3.5g per litre, but this is far from critical. Once you've worked out how much is required, it's fairly easy to estimate the required weight as a proportion of the size of the pot, which is likely to be 50g. Add the required amount of calcium carbonate to each vessel and mix in by either stirring or shaking. 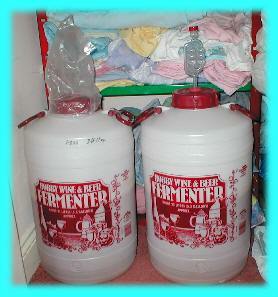 You may well have read about sterilising a lot of things when making home wine, but so far this hasn't been mentioned. This is because there's not a lot of point in being particular about grapes that have come from the garden. The problem now is if you just leave the grape juice, it would probably start fermenting. 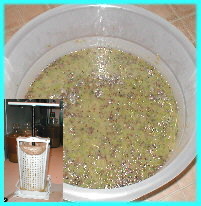 However, these natural yeasts are likely to result in a vinegar-tasting wine. The solution is something called Campden tablets. These are mainly sodium metabisulphite, Na2S2O5, and react with the acid wine to release sulphur dioxide which kills the yeast and many other unwanted organisms. Campden tablets are easy to obtain from any wine-making outlet and are a standard size. Add about one tablet to each UK gallon or 5 litres of grape juice. 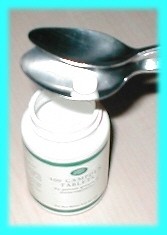 To add the tablets crush them to a powder between two teaspoons and drop them in. Then give the vessel a swirl. Do not inhale the gas given off, especially if you are asthmatic; follow the instructions on the pot. Now put an airlock filled with water into a bung in the top of vessel as shown. Put your soon-to-be wine in a warm place, like an airing cupboard, and wait for around 48 hours for the effect of the Campden tablet to wear off. The wine will produce some gas, but this doesn't mean that its started to ferment as the chalk will be releasing carbon dioxide as it removes some of that excess acid. 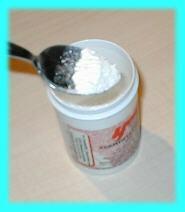 Wine yeast can be bought in either little sachets or in pots. I much prefer the sachet as the pots won't keep from one year to the next. 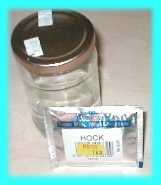 Choose either a hock or what's known as "formula 67"; I use hock. You will only need one sachet per year. Put 4oz or 125ml or water into a jam-jar and boil the water in the jar in a microwave. Take the jar out and put the lid over the top but don't do it up. Put the jar in warm place and wait a few hours for the water to cool to the warm place's temperature. Now open your sachet and put the contents into the water and give it a good shake with the lid on. Then loosen the lid and put it back in the warmth and wait for about 4 to 6 hours. Don't leave the lid screwed on or the jar will go bang. There's sugar and nutrient in with the yeast, so it'll start to grow in the jar. After the 4 to 6 hours, the yeasty water will have gone foamy. Give it a good shake, and share the contents equally amongst your wine vessels. Replace the airlock. There's nothing to do now but wait. After a few hours the wine should be bubbling away, and bubbles of carbon dioxide should be going through the airlock every few seconds. It'll take between a few days and couple of weeks for these to stop. Once they have, the wine can start to clear. I never do anything here. I don't decant the wine into other vessels but leave the wine over its lees to settle. This is what is meant by a "sur lie" wine or "on the lees" in English for an English wine. If all has gone well, the wine will clear totally in a few weeks and you'll be able to see right through a whole demijohn. If you can see though that much wine, it will look crystal clear in a glass or bottle. The picture here shows two giant fermenters, but whilst these make bigger quantities easier, it can be hard to tell if the wine is clear. Don't be tempted to hurry, keep water in the airlock and don't open the vessel. Just wait until it has totally settled. 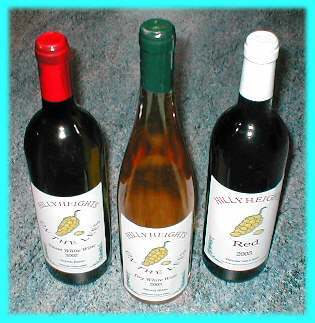 If you want sweet wine, there are some extra steps to do, which are listed HERE. Otherwise you will make a dry wine. In resent years, I've started to add some preservative, potassium sorbate, to my dry wine. As mentioned on the sweetening page, this is vital for a sweet wine, but it's optional for the dry. You can ignore this step if you're making a sweet wine as adding potassium sorbate is already covered. Adding a little potassium sorbate will stop the wine re-starting its fermentation or undergoing any form of "secondary fermentation". Personally, I'd advise following this step, but others may feel that they want a purer product. Potassium sobate is sold in most wine-making shops as "fermentation stopper". You need to add 1/2 a teaspoon for each UK gallon (4.5 litres) of wine. Syphon your wine into another clean vessel. It's important that the vessels are clean, so use baby's sterilising fluid and then rinse well. I use a wine filter to catch any little bits of sediment that are disturbed, but it's very important that the wine is already absolutely clear. Don't expect the filter to do any clearing for you; it won't. Take a look at Step 12, bottling, for syphoning hints. Before bottling, you need to start some corks steaming; see below. Once totally clear, the wine is ready for bottling. You can re-use wine bottles that have been thoroughly rinsed and cleaned with baby's sterilising fluid and then rinsed well. Syphon the wine into the bottles. A special tube, as shown in the photograph to the left, is a very good idea as it makes not over-disturbing the sediment easy. As it's very hard not to disturb the sediment at all, I always use a filter. However, this is the only reason I use a filter as the wine is always totally clear without it. Never expect a filter to clear wine for you; it won't. Corks are bought from wine-making outlets and are put in using a corker, which is a tampered tube and plunger. The corks need to be softened to make this easy and I have found a method of doing this: steaming them. They will be soften in about an hour and can be taken one at a time and used hot. 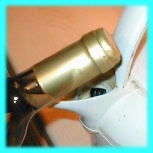 The hot corks are very easy to push into the bottles using the corker; see right. Alternatively, you can buy metal lever-type corkers which will have no trouble forcing a dry cork into the bottle. Your wine is now finished and bottled, but for a finishing touch, it's a good idea to shrink professional-looking caps onto your bottles. Once again these are easy to obtain from a home-brewing shop. 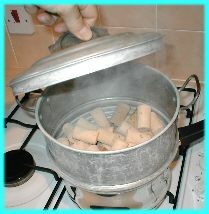 They are put on with the steam from a kettle as shown. The final thing to do is to put on the label. In order to keep the cork wet and the air out, your wine must be kept on its side. Wait at least six months before opening your first bottle. Crystals may form in your wine; these are nothing to worry about; READ HERE. Step 16 Drinking the Wine... No instructions required.